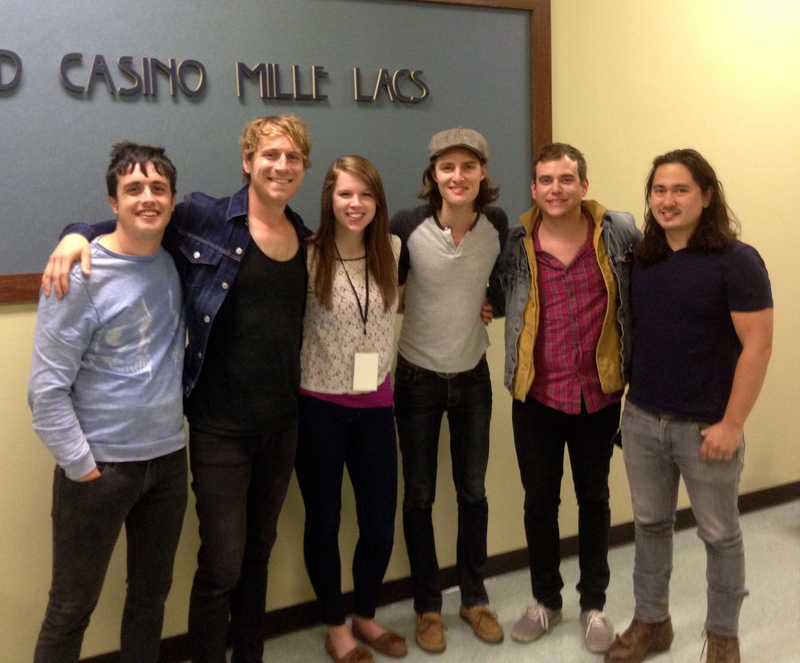 It was an action-packed long weekend, the most exciting part being meeting Parachute on Saturday before their concert at Grand Casino Mille Lacs. 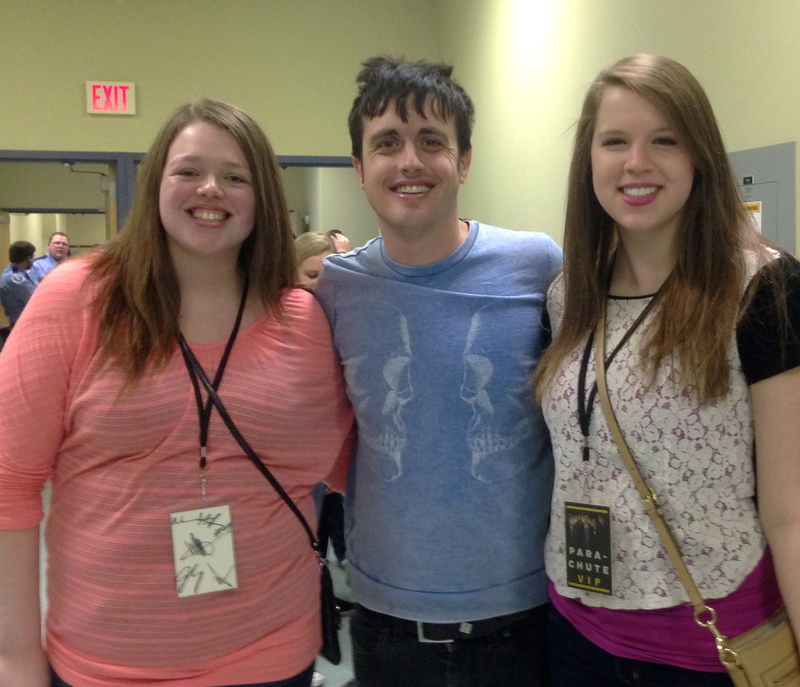 I would say Parachute is my favorite musical artist as Saturday was the 8th time I have seen them live. 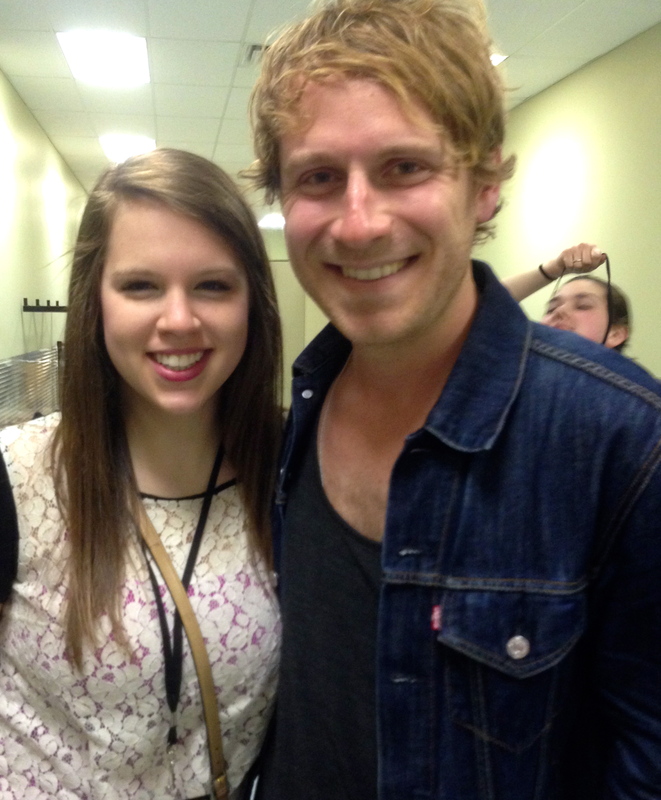 On a whim a few months ago, Alyssa and I decided to get VIP tickets in order to meet the band before the show. It was pretty dang awesome. They played for us for a bit which was really cool to see from less than a foot away. Then we chatted and took pictures. Alyssa and I were the oldest girls there and felt a bit awk/fangirlish, but it was still great. There were other people who drove all the way from Green Bay and Illinois so we didn’t feel too stalker-like. 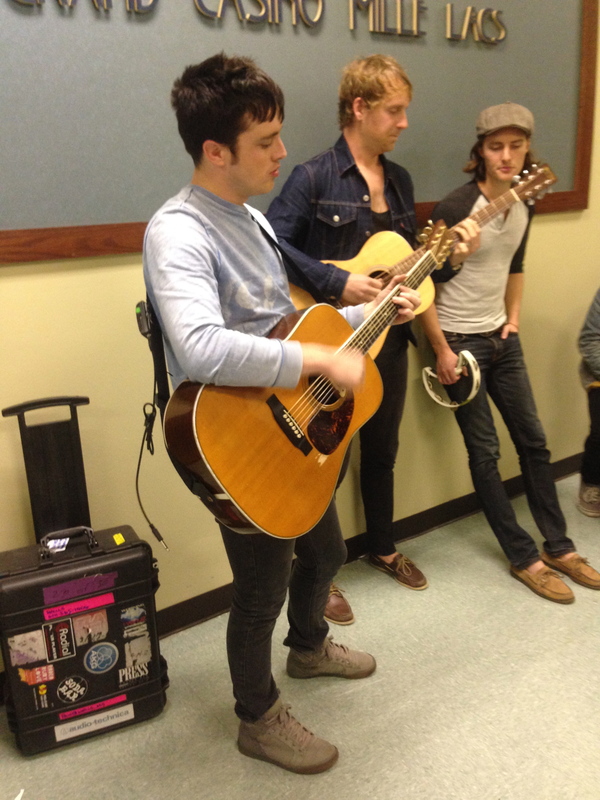 With the whole band and Nate, the guitarist, on the right. Let it be known that Will, the lead singer (pictured below), said “I know I’ve seen you before.” YEAH because I’ve been at errry concert in Minnesota. Will took this selfie of us on my phone… (he held my phone!) Big deal. It was funny because you could tell they did not want to be in the middle of no where Onamia, MN. 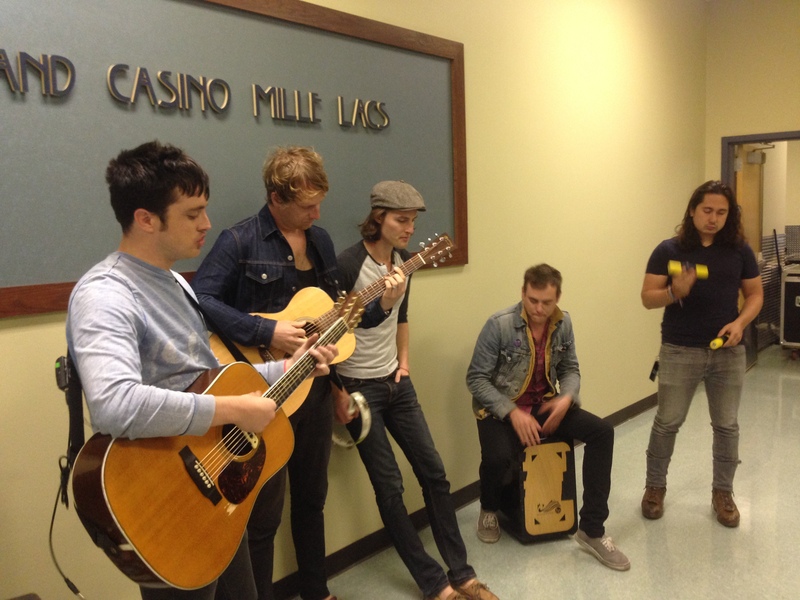 I told Nate how I’ve seen them at Mill City Nights, The Cabooze, and The Varsity Theater and he said, “man, I wish we were at one of those places instead of here.” The venue was set up really strangely too; it looked like a conference room. Even the chairs looked all business-y. We wanted to rage but couldn’t. Oh well. Well, it’s time for real life to kick in. No more breaks. Maybe I should start on the 8,000 papers I have due before graduation. Probably not though. I also fell asleep outside yesterday and got sunburnt in the weirdest places. (Boring blurb about the weather): This past week was such a tease. It was freakin’ gorgeous out all week I had to froyo twice. We’re back in the 30s today… I guess I’ll take it over negative 30. So here it is, the post about my five favorite songs. It’s finally happening. In reviewing the list, I realized that this is not a very good reflection of my actual musical tastes. I’d like to think I’m a bit more hipster/interesting/less pop-y than these songs get at, but these are my classics. Also I’m probably not even hipster at all, so it’s cool. Also x2, these are in no particular order. I am also able to say that I’ve seen all of these artists live, which is fun. Out of my general obsession with Parachute, it always comes back to this song. I’ve seen it performed live close to 8 times now and it’s always my favorite. The best is listening to it really loud in the car. 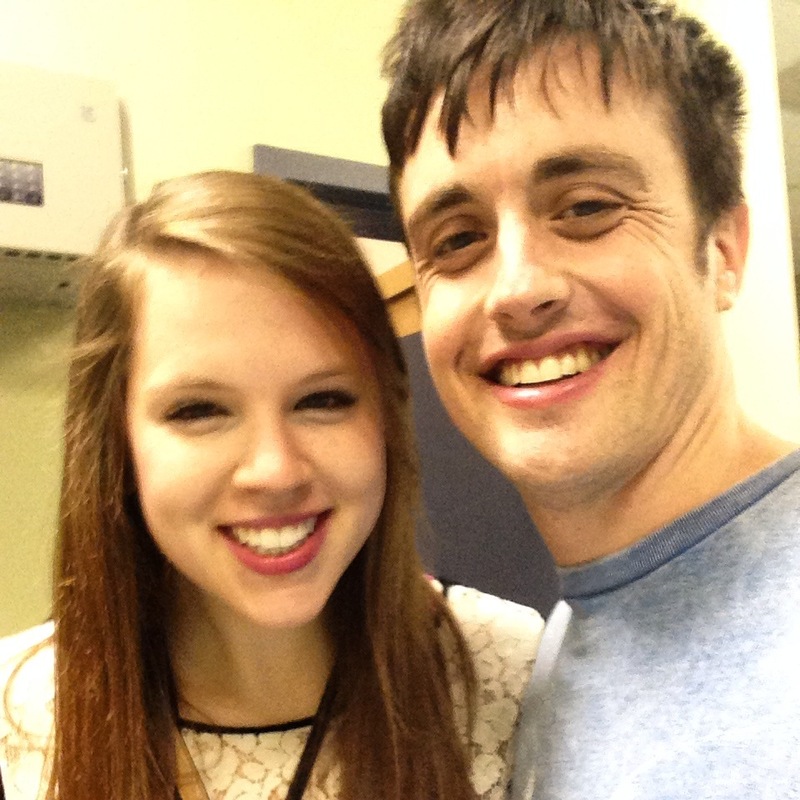 On a side note I am meeting Parachute in less than a week! My roommate Alyssa and I are going to their concert this Saturday with Gavin Degraw and have meet and greet passes, nbd. 3. The Gambler – Fun. I am basing this list of off songs I’ve known for a long time and can still listen to them on repeat. I used to look up different versions of this song on YouTube and spend hours watching different performances. (I guess I had a lot of time on my hands?) I even wrote a blog post about it on my old blog (really long time ago). I also never lose a chance to tell people that “I knew Fun. before they were popular; I saw them open for Panic At the Disco”). Annoying, I know. Had to throw in some Jesus music. This one is a good uplifter on a sad day or I’ll listen to it when I’m nervous for something. A good reminder that everything will be okay. I knew I wanted to pick a Kelly Clarkson song but struggled because there are so many good ones. I settled on this one, although it’s not super old. I think it’s my favorite… but also A Moment Like This is KC classic. 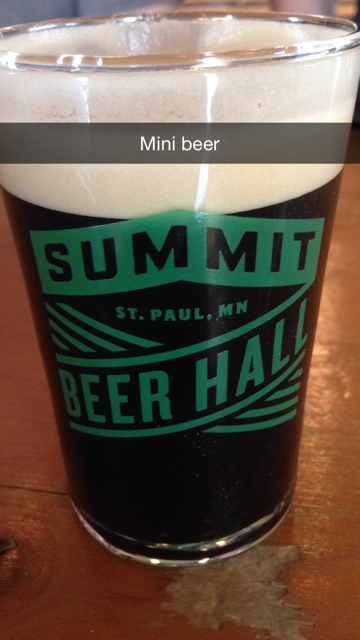 I went on a brewery tour for the first time last Friday. It was interesting even though I’m not an avid beer drinker. It kinda looked like it could be a good set for a horror movie. 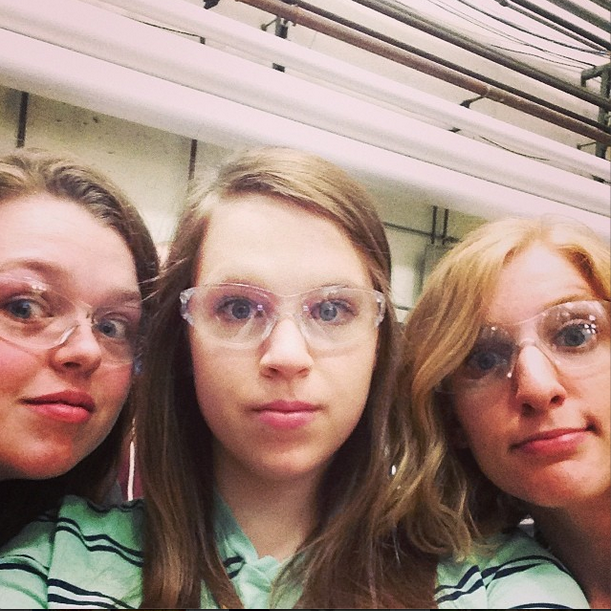 They made us wear safety goggles and had free samples. It was G times. Happy April (I still need a job)!!! Graduation is looming…. less than 50 days now. Senioritis has kicked in (and is here to stay) since coming back from Spring Break. I skipped my first class of the semester last Thursday…. mainly because it is Family Communication, or what I like to call, “Girls Bitching About their Families.” It worked out though because while I was skipping I ran into two other girls from my class who were skipping as well. Okay good story. ANYWAY onto the March Favorites. Some interesting ones this time around. I took a mixture of these to Chicago with me and it was a life saver. I didn’t want to take pretzels or cereal or anything like that because I knew I would just sit on the Mega and eat them all. These are good to have because they tide you over without being so addictive that you can’t stop eating them. Speaking of almonds, I’ve recently developed a taste for almond milk. I’m pretty sure it’s an acquired taste as I used to think it tasted like cardboard. For some reason I feel like it’s better for you than soy milk? Not sure how true that is. Anyone care to weigh in on that? All I know is that I’m terrified of GMOs (thanks, Bruce). 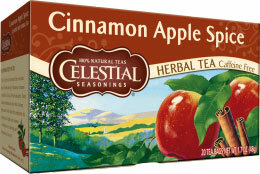 Celestial Seasonings is where it’s at, yo. I was picking up more peppermint tea and decided to try this kind. It tastes exactly like apple cider, without any sugar/calories. Super addicting, I’ve had a cup every night for a week. 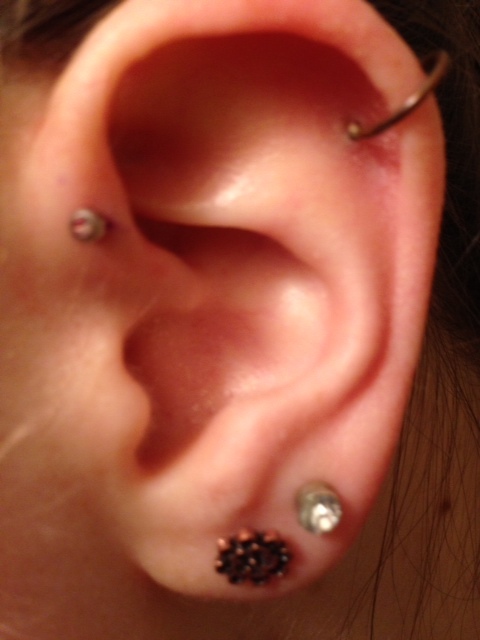 Okay sorry for the creepy ear close-up but obviously this one requires a picture. When I returned from city hopping over spring break, I had a few days to chill before school/work started again. On Saturday my roommate Alyssa and I were feeling a bit impulsive….. so we got our ears pierced. My sister influenced me to get the “helix” pierced. She then sent me a picture of an ear diagram where it names all the different piercings one can get. Kinda scary, there are numerous. I’m a fan of Kat Krazy remixes; they have a couple Bastille songs that are good too. I’ve recently gotten into Neon Trees and I listen to this song at least 3 times during workouts. Also, this. Gotta love it. 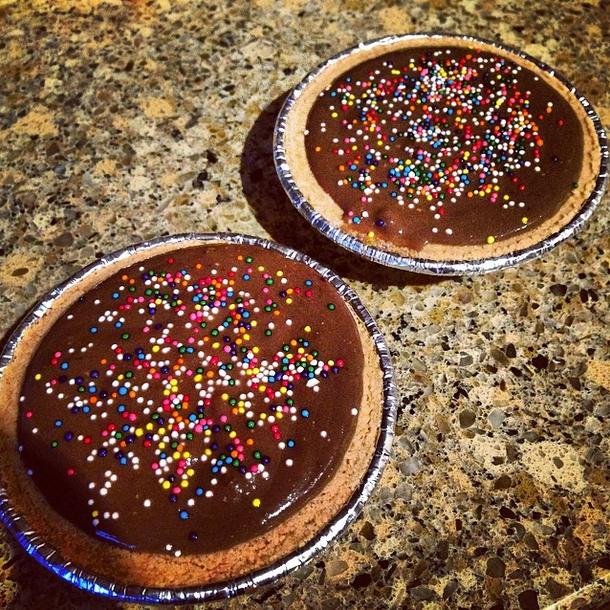 And just in case you were wondering, this is what I did this weekend: Mini pies. For the first few days of break I was in Manhattan with my parents. 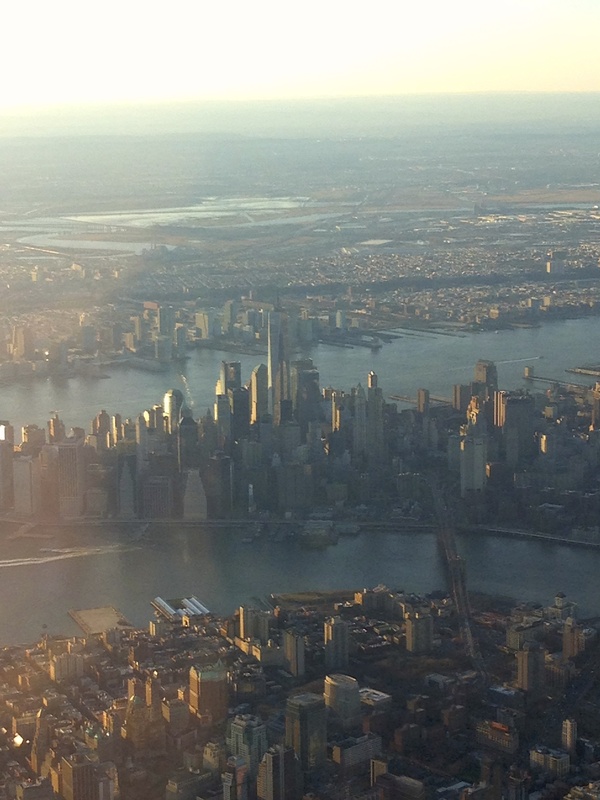 I’d never been to New York before and decided to venture there with my parents as a graduation present. 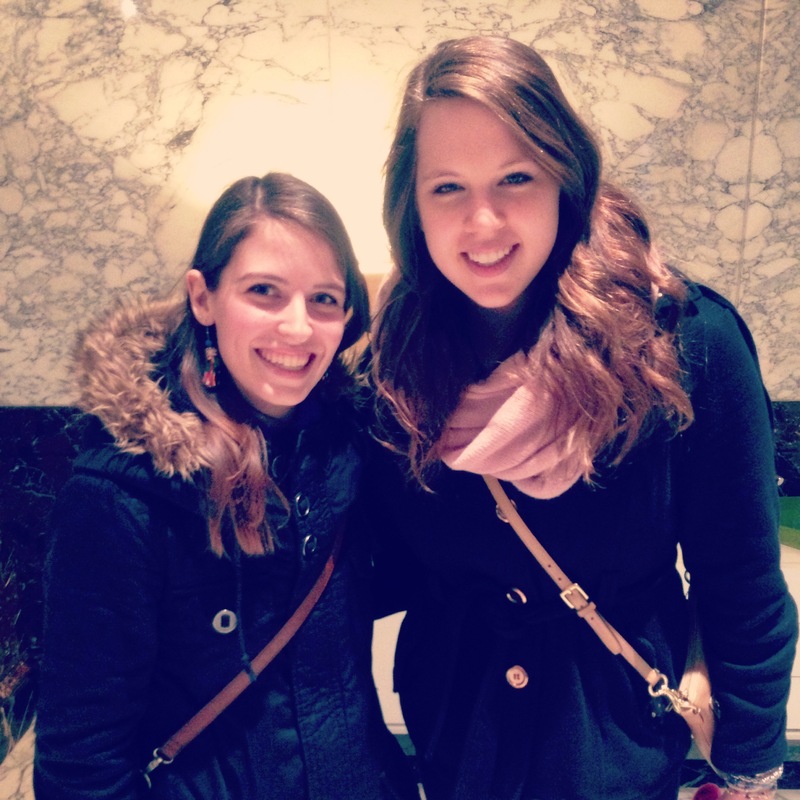 To this authentic Minnesota girl, NYC is absolutely insane. People and lights everywhere. Times Square was the most bewildering. We were there at 10:30 at night, yet all the lights and screens made it feel like it was daytime! Saturday we spent the day walking through all of Central Park (which I didn’t know is actually just a huge rectangle in the middle of Manhattan? Central Park, go figures). 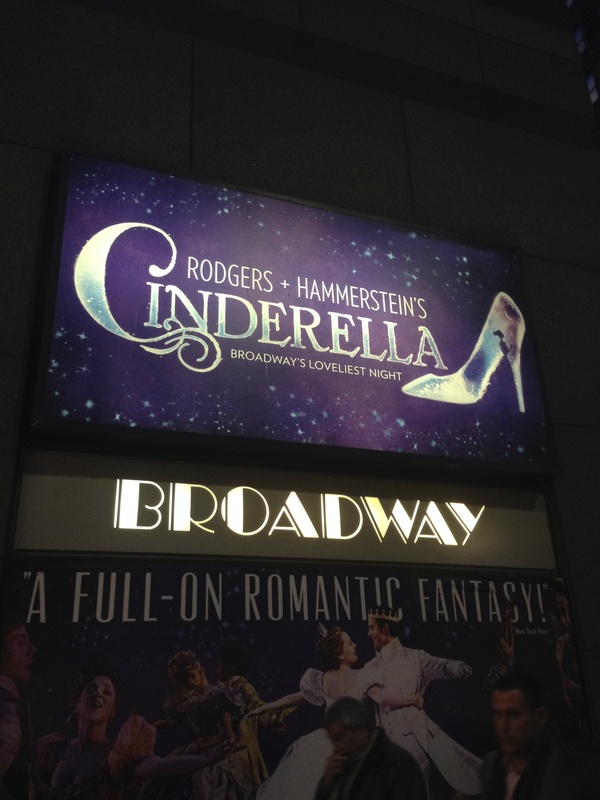 Saturday night my mom and I saw Cinderella on Broadway. If anyone really knows me, you know that I’ve been consumed by Cinderella since I was a baby. And not just the Disney version. Rogers & Hammerstien’s, yo. Or the Brandy/Whitney Houston version. OMG. 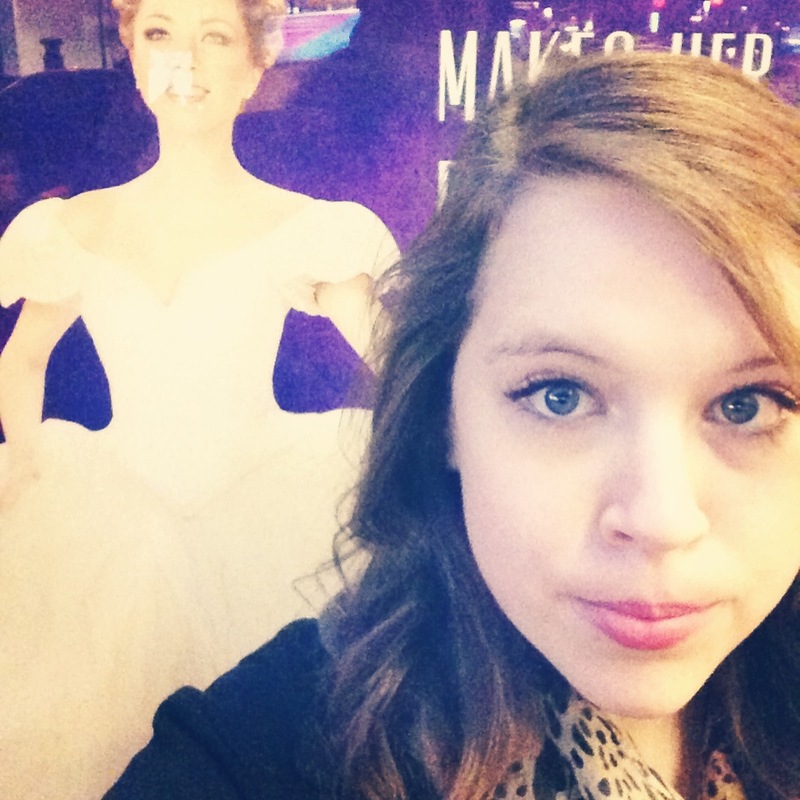 Seeing it on Broadway (with Fran Drescher as the step-mother!) was an actual dream come true. I cried. Twice. On Sunday we went to the 9/11 Memorial and saw the new World Trade Center building. It was very eye-opening and somber to realize just how many people were affected by the events of that day. I’m really glad for the experience. Later we explored Chinatown and Little Italy. Chinatown was… anarchy. Little Italy had cute restaurants and bakeries; it really did remind me of being in Rome or Florence. Later that day I had the privilege of meeting up with my 5th grade locker buddy who is currently living/finishing up her last semester of college in Brooklyn. It was unexpected but so fun to catch up with her for the first time in years (am I really that old?). Monday morning we ventured to the Museum of Natural History. 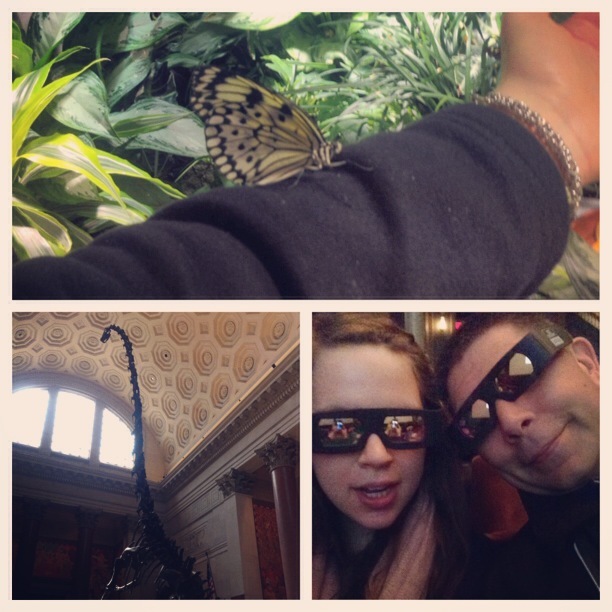 They had dinos, butterflies, a planetarium, 3D movies and such. Apparently it is good luck if a butterfly lands on you. The museum was quite impressive (and huge), but I think I reached the max amount of time I can spend staring at dead (stuffed) animals. 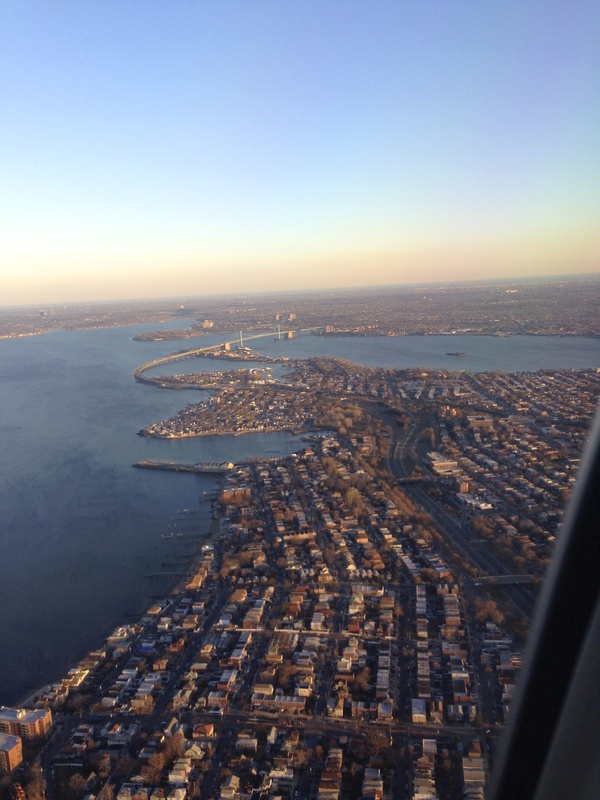 We flew back to Minneapolis Monday night. After being home for a total of 14 hours, I boarded the MegaBus for Chicago. Everyone always seems to be amazed that I’ve taken the “Mega” (as I call it) by myself so many times to Chicago, but I actually really enjoy it. I’m accustomed to really long drives and love to simply listen to music, stare out the window, and contemplate life. I ran into some bad Mega luck this trip though. On the way there, the driver openly admitted, “This is not my normal route. Please be patient because I WILL get lost.” She then proceeded to ask for directions to every stop. Thankfully she was a fast driver, and we were only about 40 minutes late getting into the city. It’s sometimes strange to remember that I went to school in Chicago. It was only 4 months, but I consider it a significant part of my life. It was an opportunity for me to grow and figure out what I wanted in a college experience. I also made some pretty stellar friends. A wise person once told me, “never burn any bridges.” I try to live my life that way. 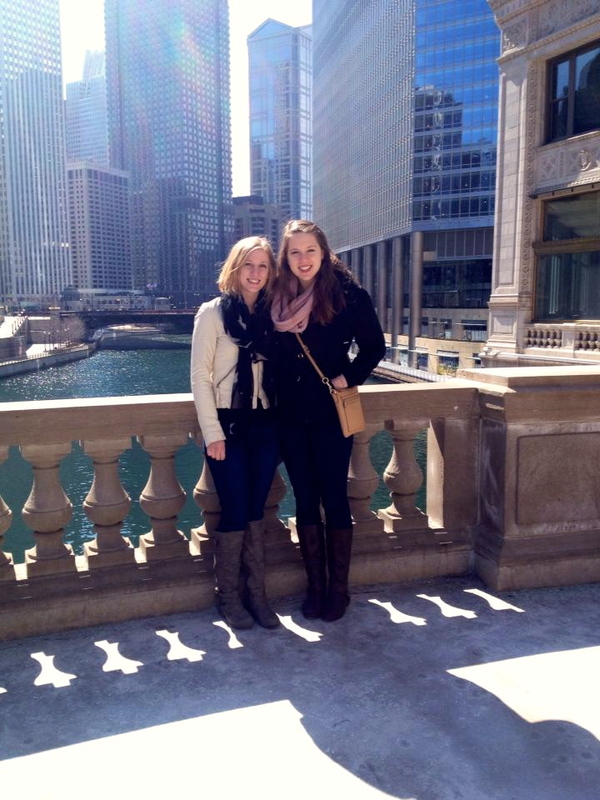 It was really cool to bring a friend from home (Maya) with me to Loyola. ANYWAY. Tuesday was spent mostly traveling and catching up with friends Molly and Nicole. 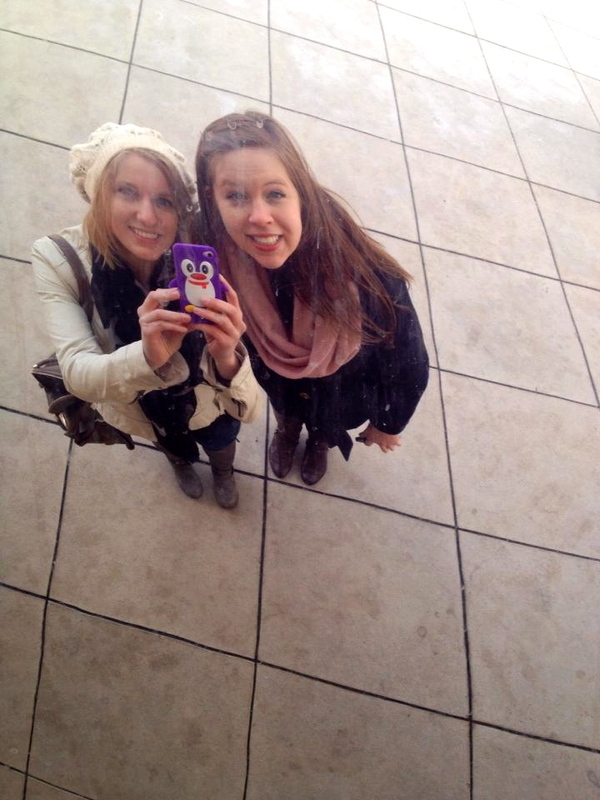 Wednesday morning I met Maya at Loyola and we decided to shop on Michigan Avenue and go see the Bean. I could spend days just walking around and looking at stuff/people watching. 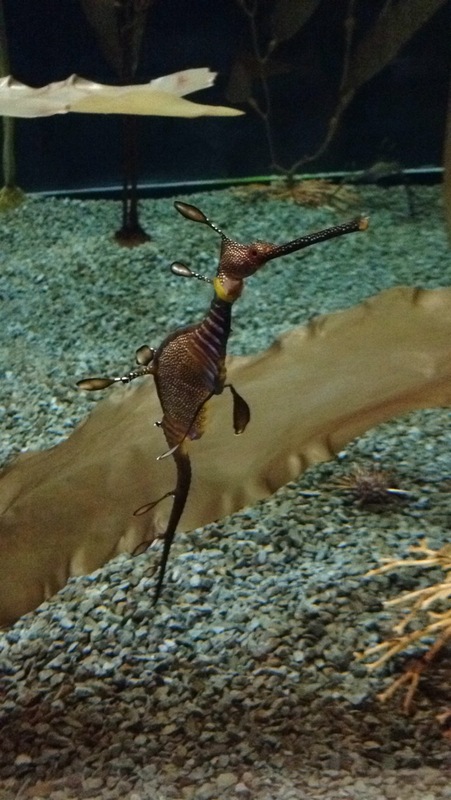 Thursday we braved the rainy weather and took the train/walked to the Shedd Aquarium. We waited in line for about 40 minutes and were getting impatient (I’m known for being terrible at waiting in lines). We would probably have had to stand there for another 40 minutes, but thankfully one of the workers brought a group of us to another entrance. I don’t know if I would have survived otherwise. It was worth it, though. 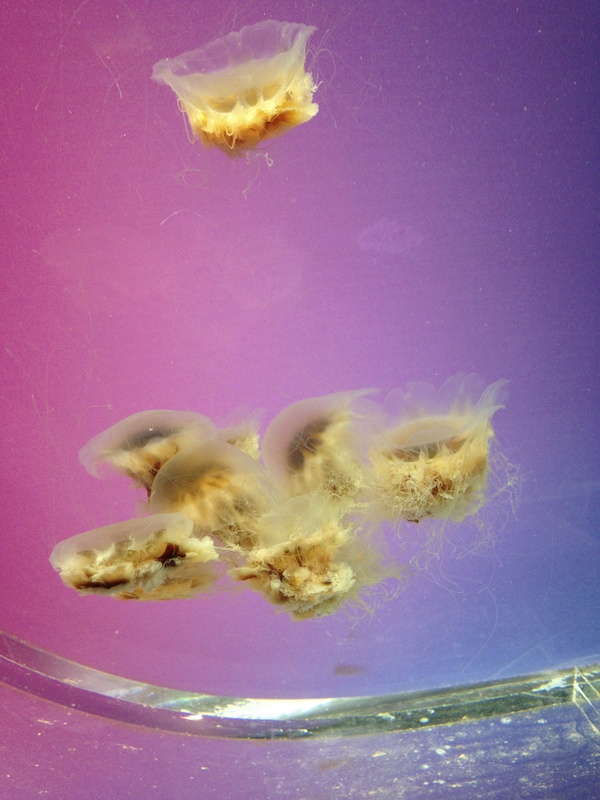 We spent 5 hours seeing some pretty cool animals. Maya found a new love for sea otters. 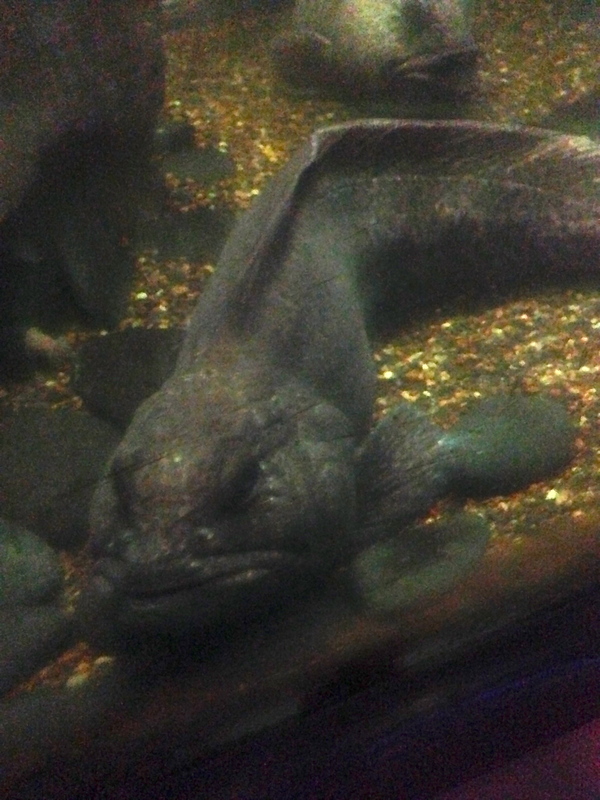 (That third picture is a wolf fish, omg). For dinner Thursday night we went to a place that was featured on an episode of Diners, Drive-Ins, & Dives –called Big & Littles. I had 2 delicious mini tacos, 1 tilapia & 1 shrimp. My city-hopping adventure came to an end the next day when I boarded the Mega back to Minneapolis. It was good to be home and chill for a few days. I completed my first successful outdoor runs of the spring season. My running shoes are all wet and muddy now, but it was worth it. AAAND now it’s snowing again today. Happy April, I suppose. Riley/Ranger/Roobie/Roober Anthony Towns — whatever her name was, we loved her for 13 great years and will remember all she gave us forever. Now she is chasing all the bunnies and eating all the peanut butter.